Sambucol is a unique black elderberry extract intensely rich in immune-boosting flavonoids. Certain flavonoids – anthocyanins – are found primarily in the pigments of dark blue and deep purple fruits such as the black elderberry. It is these that have a remarkable ability to stimulate the body’s immune system. According to the United States Department of Agriculture, the highest concentration of anthocyanins are found in black elderberries – nearly double the amount found in any other fruit. Sourced from nature, developed by scientists and laboratory tested, Sambucol® is used by millions the world over. 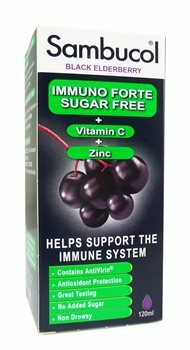 Black Elderberry extract; including the active ingredient Antivirin®; sugar free, suitable for persons who must control their blood sugar. Purified water, elderberry extract, sweetener: sorbitol liquid, raspberry extract, citric acid, preservatives: methyl p-hydroxybenzoate, propyl p-hydroybenzoate. Adults: 10 ml (2 teaspoons) four times daily. Free from gluten. Free from artificial colours. Not suitable for children under 3 years. Do not exceed the recommended intake.